After eight days at sea without a glimpse of any land, ships, birds, or life of any kind, it was indescribable to wake up and see the beautiful island of Madeira slowly filling our balcony window. Even though we had to set our clocks forward AGAIN (for the seventh time!) we leapt out of bed and ran out to the balcony to take it in: seagulls circling the calm harbor, rising sun lighting up the red roofs of the buildings on the west side of the island, lush trees and tropical plants peaking through the buildings, rising up into huge peaks still blanketed in thick fog. Madeira is part of a cluster of four Portuguese islands to the west of Morocco, and it is truly one of the most beautiful islands I’ve seen. I was expecting to notice the adjustment of walking of land after so many days at sea but it really wasn’t very obvious. Thanks to the planning of our cruise buddy Lindsay, the four of us were among the first people off the boat and we knew right where to go. 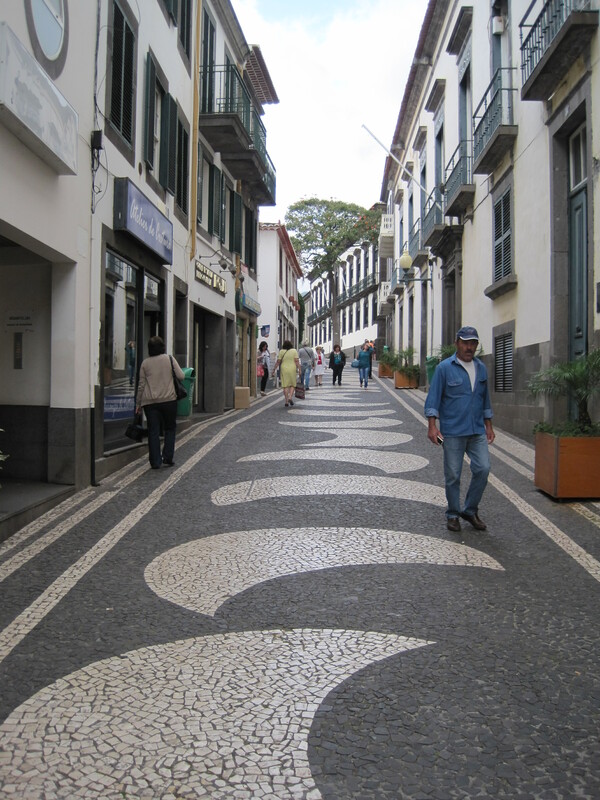 We spent the morning walking to the heart of Funchal, the main city of Madeira. We all noticed the unique juxtaposition of European culture and architecture in a tropical setting. 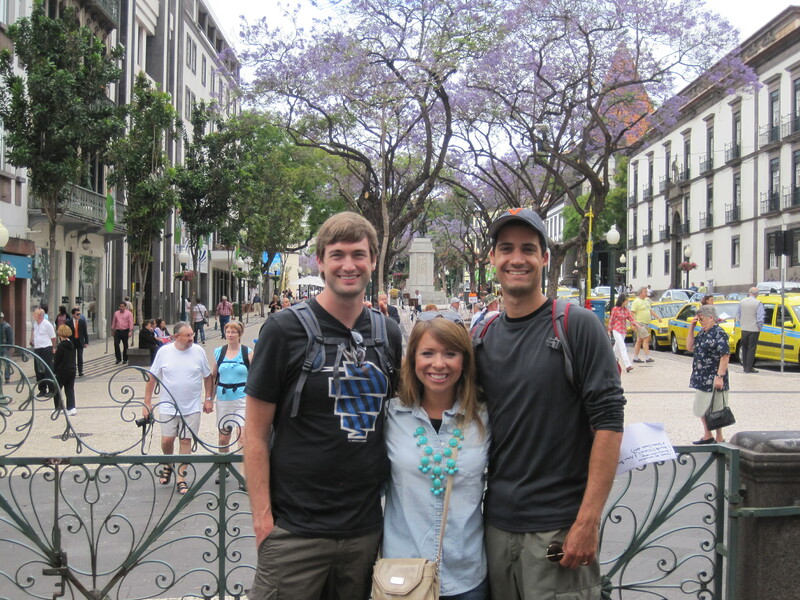 The jacarama trees that we loved from our trip to South America were exploding in purple blossoms all over the town, showering petals onto the cobbled streets. Mike teased me because I couldn’t stop pointing out how every single street was cobbled with a unique mosaic of tiny black and white stones– from crescent moons to zigzags to tesselated gingko leaves, every one was a detailed mosaic done by HAND. We even saw a worker sitting on the ground hammering the little stones in to repair a section of the street– working at typical European/islander speed, he would need to restart his repairs by the time he finished! After roaming the streets and entering a few city buildings, we stopped by a gluten-free bakery to get a treat for Lindsey and then the four of us found a local’s cafe to enjoy a coffee on the terrace. We then caught the cable car up to the town on the top of the mountain, appropriately named Monte. The view from the cable car was gorgeous- red rooftops, grassy terraced gardens all the way up the mountainside, goats and chickens, blossoming trees, and the endless ocean below. The cable car dropped us off in a completely different climate of drizzly, atmospheric mountain fog. Up in Monte we walked the wet streets, visited an old chapel, and found no shortage of public gardens to amble. Despite the fact that it was raining and the streets were dangerously slick, we decided to partake in Monte’s main attraction: a two-kilometer descent in a wicker basket attached to two wooden planks that ski down the steep streets guided by two Maderians dressed in traditional garb. This “toboggan” set-up is hardly safe, as the only steering and control is dependent on these men’s ropes (steering) and rubber boots (brakes) as they run wildly behind the sled to keep up with it as it winds down the sharp curves of the mountain. Despite the fact that Lindsey and Mitch’s guy fell down, we made it to the bottom alive. By then we were starving and we found a cute little cafe that happened to be in one of Madeira’s many “public WiFi plazas”. We ate delicious sandwiches, salads and papas fritas and caught up with the Giants on the iPhone. 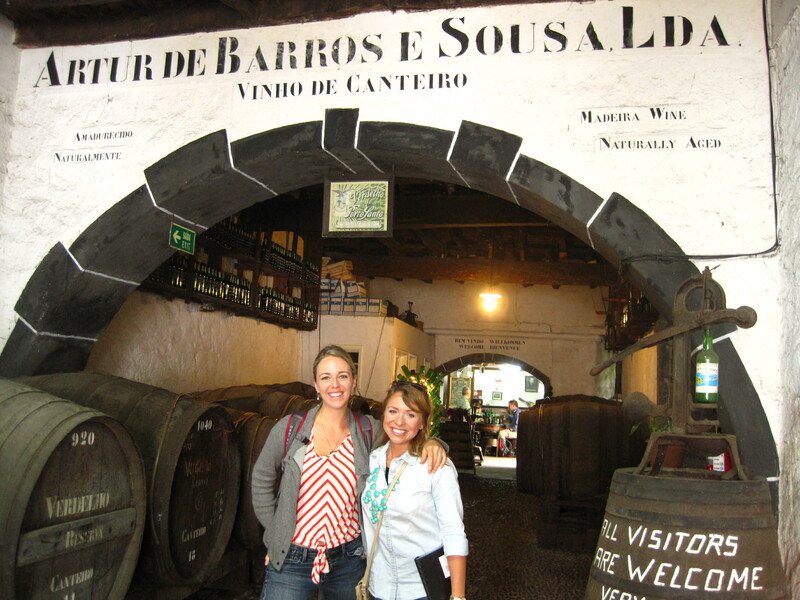 Then we took off to hit all four of the cellars that offer Madeira wine tastings, guided by Lindsey. All four cellars were unique, especially one operated by a friendly but crazy old man named Artur who burst out laughing every time we answered his questions. 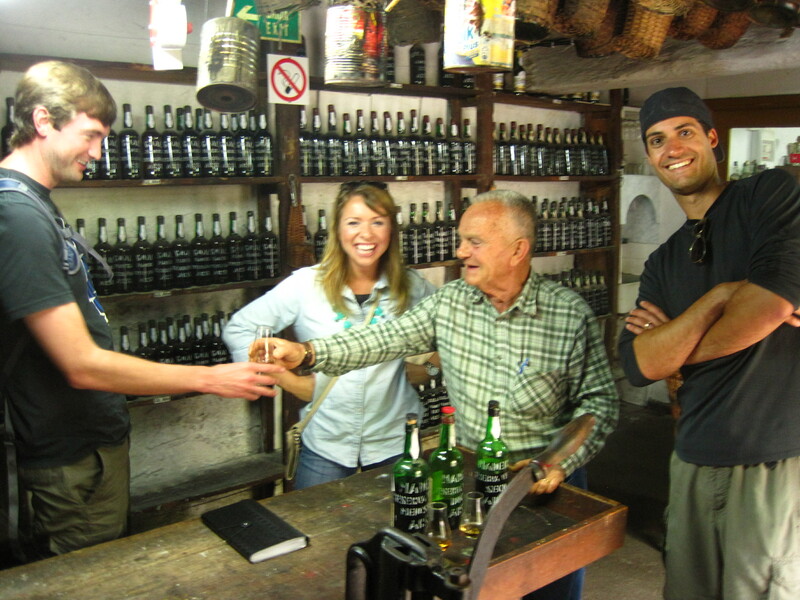 We ended up buying a bottle of five-year medium dry Madeira, the unanimous favorite. To fill our remaining hour we sipped an espresso and caught up on email at a cafe terrace on the Madeira equivalent of las ramblas. Good people watching, including an ambiguous parade of traditionally dressed Portuguese locals singing and playing down the street. To round out this very special day, we crammed all four of us onto our balcony to enjoy our Madeira wine (and sushi!) 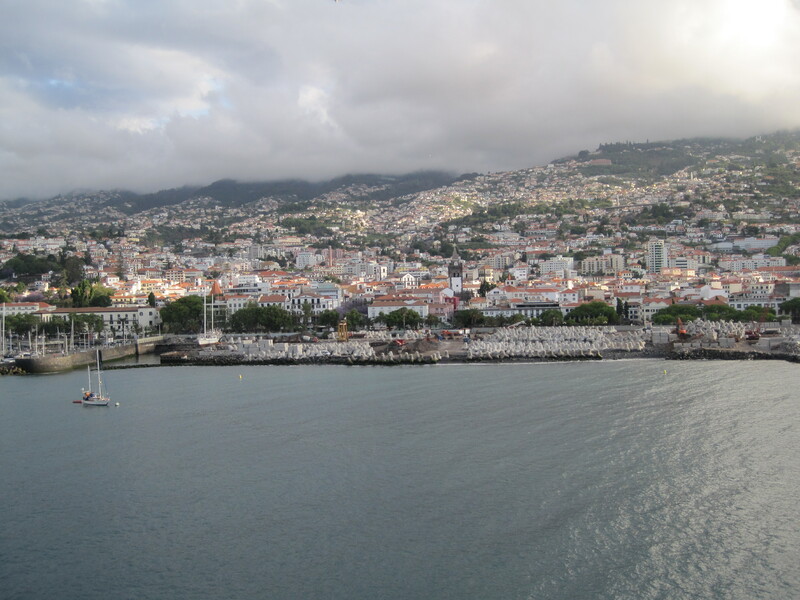 as our ship departed from Madeira. We were fortunate enough to be on the port side and had about an hour of slowly passing island views as the sun set. As for our remaining port days, it will be hard to top this one. 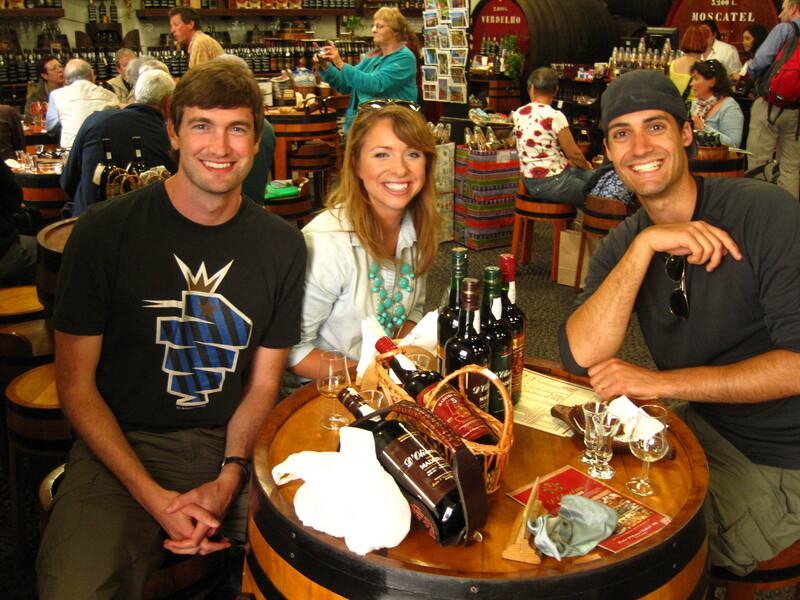 Laura and Mike, I’m thoroughly enjoying your travelogue. Just jumped back to this day’s entry so I can cite my favorite detail so far: “tesselated gingko leaves.” TGL just might make its way into the lexicon of internet slang, who knows. In any event, keep ’em coming. Have a great time. Stay well. Be happy.